The new Peugeot concept car is a two-seat roadster with an exceptional appearance, a futuristic style and original architecture, designed to provide intense driving pleasure and to celebrate the brand's 200th anniversary. EX1 has broken six world records for acceleration from a standing start*. *Subject to FIA homologation. The project to create an exceptional vehicle to celebrate Peugeot's 200th anniversary quickly allied itself to another goal: mobilising all the historic skills devoted to electric motors. This two-seat roadster is 90 cm high and 1.77 m wide and has adopted the Peugeot styling codes that were seen on the SR1. Polished aluminium components structure the door surrounds, harking back to the RCZ and the BB1. Evolved from the experience gained with the Asphalte concept car in 1996 and the two 20Cups in 2005, the concept architecture for the EX1 enables the size of the passenger cell to be reduced in order to optimise load centring, thus reducing loads when cornering. Two electric motors are mounted on each axle with peak power of 125 kW each (250 kW/340 bhp in total), and constant maximum and immediately available torque of 240 Nm to the front and rear. This mechanical architecture not only enables weight distribution but also four wheel drive to be optimised. The Peugeot EX1 has broken six records at the legendary Linas-Montlhéry circuit: 1/8 mile / 8.89 sec / 50.61 mph* 1/4 mile / 14.40 sec / 62.4 mph* 500 m / 16.81 sec / 107 kph* 1/2 miles / 23.85 sec / 75.46 mph* 1000 m / 28.16 sec / 127.8 kph* 1 miles / 41.09 sec / 87.6 mph* *Subject to FIA homologation. 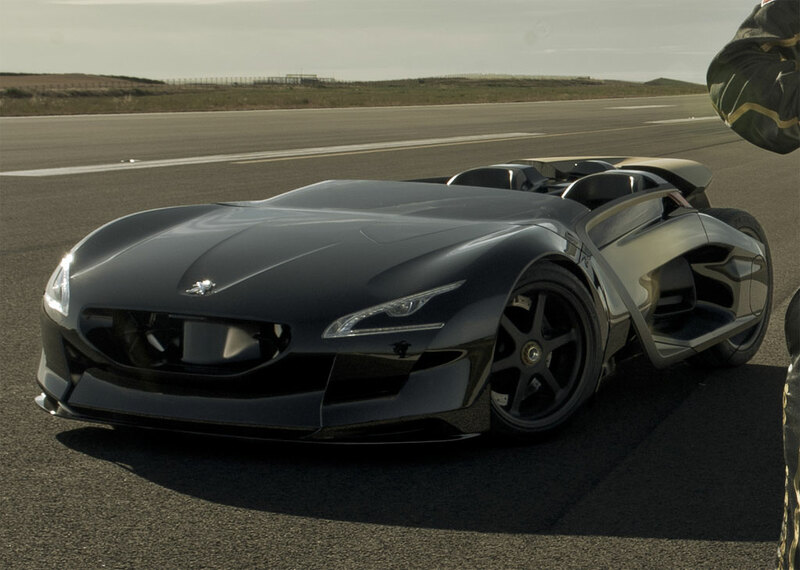 For this performance, the concept car was driven by Nicolas Vanier, the French adventurer and explorer.